Facts and history about the life and lifestyles of Native American Indians. 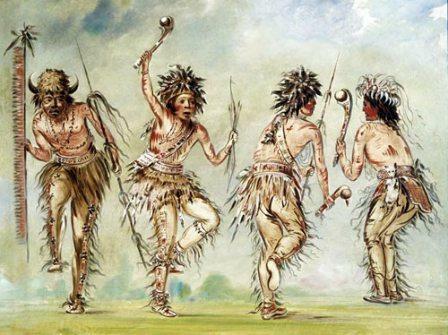 There were many hundreds of Native American Dances that were performed by all the different tribes across the continent of North America. Dancing was always accompanied by music including the beat of drums, rattles, whistles and the chanting of singers. Dances were performed for a variety of reasons to mediate with spirits forming part of great religious ceremonies and rituals They included war dances, victory dances, fertility dances, homecoming dances, rain dances and dances that reflected creation stories and mythical legends. The Hidatsa Dog Dance is depicted in the painting by Karl Bodmer. 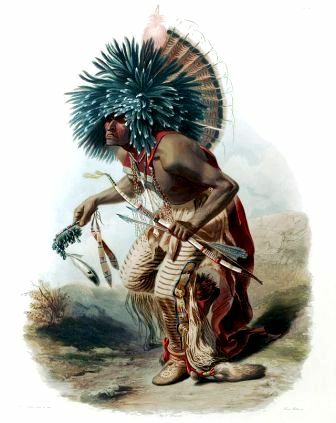 The name of the Hidatsa dancer is Pehriska-Ruhpa meaning "Two Ravens", a principal warrior and leader of the Hidatsa Dog Society. A dog dancer was one of the bravest warriors of the tribe and would to fight to the death to protect his people. The Dog Dance imitated battle manoeuvres and was performed to bring success in battles. The Dog dancer's striking blue headdress is made of wild turkey and magpie feathers. He holds a war whistle and a Dog society emblem of a rattle made of deer hooves or deer claws attached to a beaded stick. In his other hand he holds a bow and arrow.